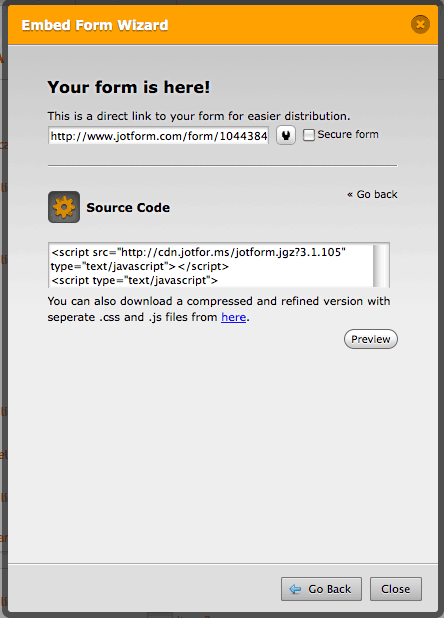 Can I tag Jotform with Google Analytics? I have just checked the forums and integration with Google Analytics is on our feature request list - however it will probably be some time before we can implement it fully. In the meantime the only way to do what you want would be to embed the full source code in your own page and then include the Analytics code there. To download all the code together, click Embed Form in the Form builder. Click the Source Code icon in the pane that pops up, then click the "here" link to download everything. I also would like that very much, thanks. We may have a few workarounds in store for you. Please open a new thread for your issue and describe how you'd want Analytics to work with your form. We look forward to hearing from you soon. Thanks! I would like to just connect the analitics code to the form so we can track our forms in analitics. If you need to install analytics to your form, you can try creating an HTML page, embed the form and add the Google Analytics. Please refer to the code below for reference on how to create a form with Google analytics.